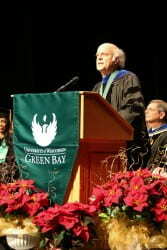 Commencement speaker Harvey J. Kaye, a UW-Green Bay professor of Democracy and Justice Studies, addressed a capacity audience of more than 2,000 students, friends, families, faculty and staff Saturday afternoon (Dec. 19) at the university’s Weidner Center for the Performing Arts. The nearly 400 graduates participating in the ceremony, seated directly in front of the stage, gave Kaye a standing ovation at the conclusion of his enthusiastic challenge. Kaye shared his perspective as historian and author of two well-received biographies of Revolutionary War firebrand Thomas Paine, along with The Fight for the Four Freedoms: What Made FDR and the Greatest Generation Truly Great (Simon & Schuster, 2014). The challenges are great, Kaye acknowledged, but their severity is hardly unprecedented in American history and, he told the graduates, he expects them to rise to the opportunity. “Bluntly put,” Kaye said, “It is time for you to make history as our greatest generations have made history. He mentioned how the American colonists of the 1770s rejected kings and aristocrats and created their historically unprecedented democratic republic. In the 1860s, citizens sustained the Union. In the 1930s, working men and women mobilized not only to rebuild the economy but to reform government and fight for civil rights. In the 1960s, the Greatest Generation followed all that — “when challenged by their own children to live up to the promise for which they had fought” — by enacting the Civil Rights and Voting Rights acts, liberalizing immigration, creating Medicare for the elderly and Medicaid for the poor, and making positive change for the environment, workplace and marketplace. 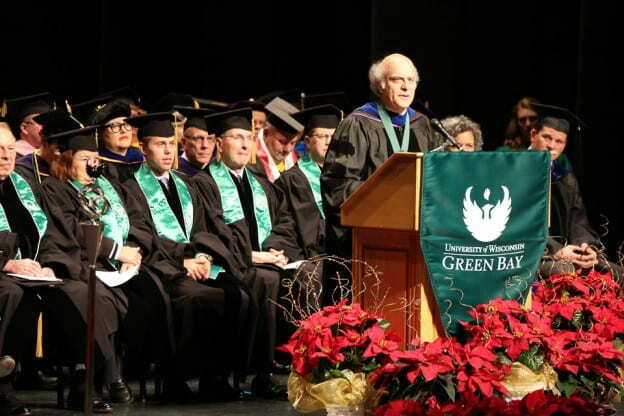 Kaye was interrupted by applause when he noted the 1960s were a time when the nation made a major push to expand educational and cultural opportunities for all Americans, as exemplified in Wisconsin by the creation of UW-Green Bay, this year celebrating its 50th anniversary. In recent years, Kaye argued, Americans have begun to forget — or worse, have been encouraged to forget — this nation’s history as an egalitarian-minded society. Kaye teaches courses in history, politics, and society. Since joining the University in 1978, he has steadfastly championed the liberal arts and UW-Green Bay’s brand of interdisciplinary, problem-focused education. He founded the Historical Perspectives Lecture Series in 1985 as a way to personally introduce his UW-Green Bay students and others to leading thinkers in their fields. Kaye is a two-time winner of UW-Green Bay’s Founders Award for Excellence and a recipient of the Ben and Joyce Rosenberg Professorship. This entry was posted in News and tagged commencement, Democracy and Justice Studies on December 19, 2015 by Christopher Sampson.